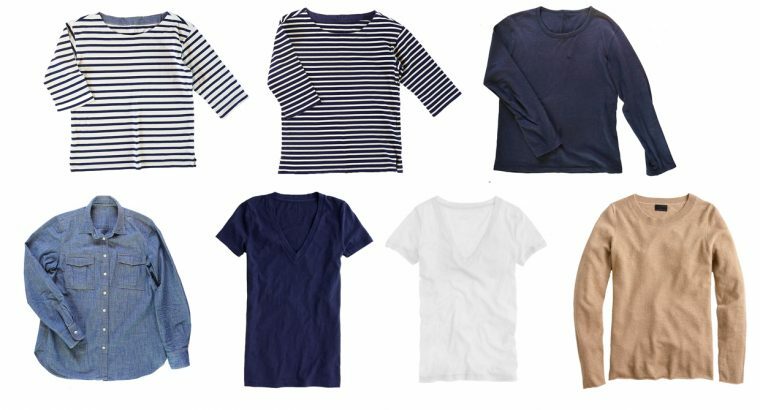 I promised you a while ago that I would write more this spring about the process of developing a personal core wardrobe. Now that the new patterns have been released, spring vacation is over, and we’re all back to work, I thought it was finally time to dive into that topic a little more deeply. Last week a good friend and her daughter came for a visit. When we have visitors here in Madrid we like to give them the master bedroom because it has its own bath. (Our New York apartment has one bedroom and one bathroom, so this multiple bedroom and bathroom thing is really new to us. Not to mention the fact that we can host guests for long stays, which is completely impossible in our tiny New York apartment.) Anyway, when we give guests our bedroom we also pull a handful of clothes out of our closets so we don’t have to be bothering them to get clothes all the time. 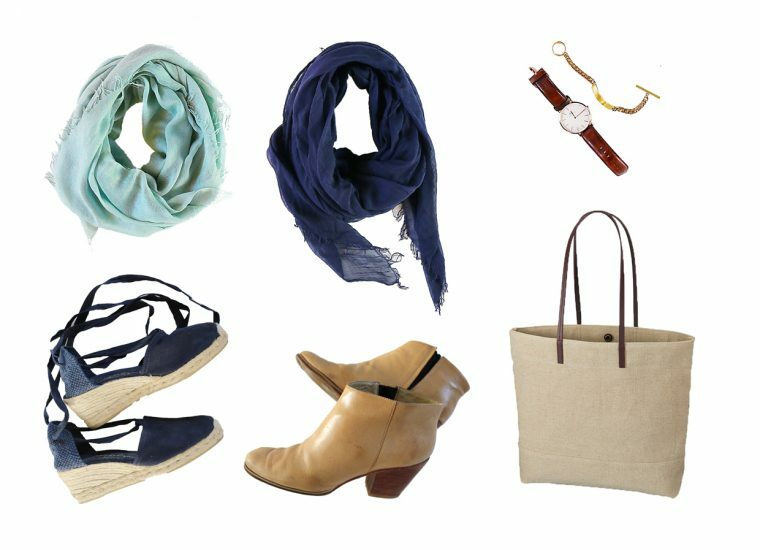 I usually just grab a few of my favorite, most versatile items rather than trying to put together an outfit for every day. And that’s my core wardrobe. 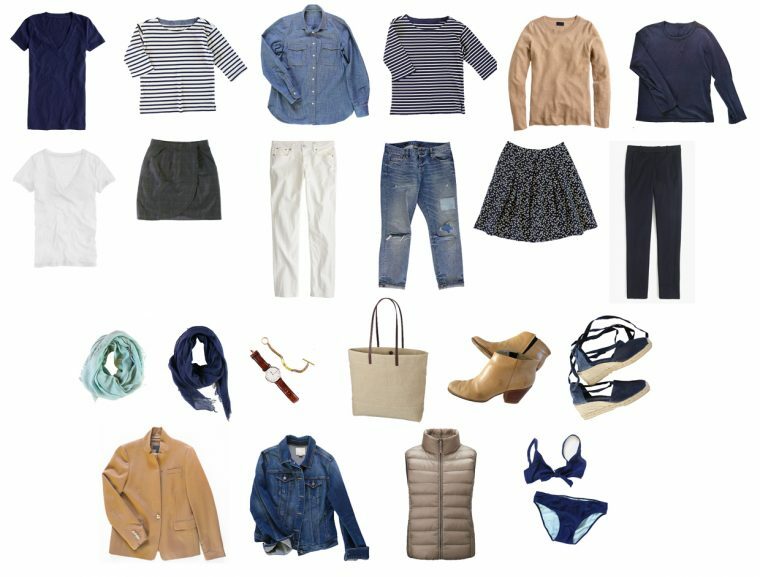 In fact, it’s the same collection of clothing I packed for our spring break vacation, so I thought I’d share it with you to show you how I assemble my core wardrobe. Here it is all together. As you’ll see, I didn’t sew everything. I’d love to do that, but if I did, I wouldn’t have time to develop new patterns! I’ll walk you through my choices to help you make sense of it. First of all, you can see my color palette quite easily, right? Navy, white, and camel. 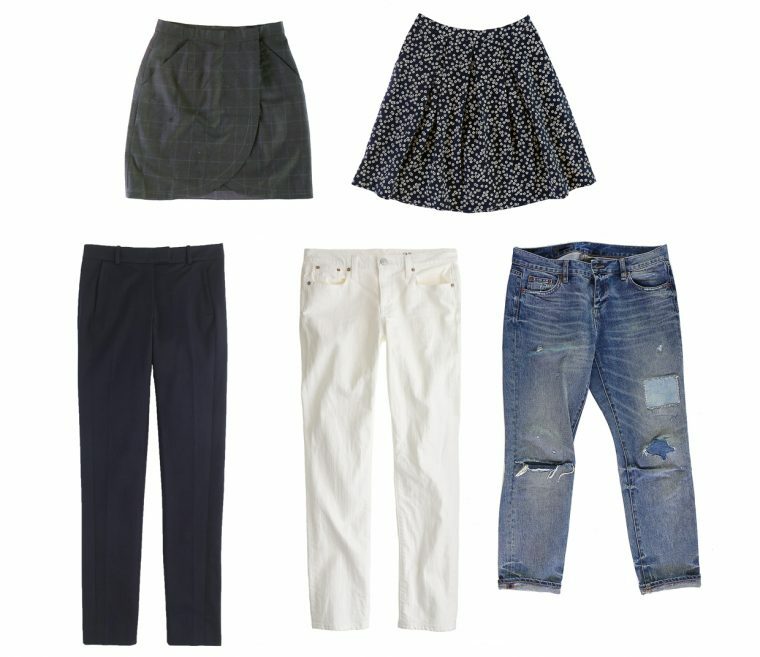 Also lots of denim and chambray. A little bit of black, and a pale turquoise accent in the form of a scarf. But I’ll break it down for you. Then I move to bottoms. Right now it’s a pair of slim black trousers, slim-fit (not skinny) boyfriend white jeans, my old ripped boyfriend jeans, a City Stroll Wrap Skirt in a faint windowpane, and the navy floral SoHo Skirt I stole from the photoshoot for that pattern. (I guess I didn’t really steal it; I was just lucky that it fits me.) Eventually I’ll get around to sewing slim navy trousers for myself, but for now I’ve purchased them in black. Then a couple of jackets because the temperature in spring is so variable. In Madrid, the change from morning to afternoon is especially dramatic. All our Portuguese friends say, “Dress like an onion so you can peel off a layer.” And they’re right! My jackets right now are a favorite wool camel blazer, a denim jacket, and a lightweight down vest I layer underneath either of them or just wear over my sweater or long-sleeved sweatshirt/tee. When I travel by air I usually pack quite a bit less than this, but since we drove to France I was a bit indulgent and took everything except the skirts and the blazer. I also included a swimsuit I just finished sewing, which was great because the weather was nice enough that we went to the beach. But this is where, if you have space, you get to add something fun. I added my custom-printed pencil skirt, which isn’t really versatile at all but adds a little bit of personal style to my core wardrobe. Maybe a cocktail dress for an evening out? If we were going to a big city or planning anything fancy I might add a dress, but for the most part I just pack separates and dress them up with shoes and maybe a fancy top and it works just fine. Can you see how everything in the wardrobe works together? The limited color palette allows me to mix and match pieces easily. And the pale turquoise accent of the scarf got picked up in the colors of the printed pencil skirt for a bit of variety. Also, lots of solids. And all the pieces can be mixed and matched. I could swap out the black trousers and the black City Stroll Skirt for navy, but I like to wear navy and black together so it’s OK for me as is. Here it is again so you can see everything together. Do you see how almost every top works with almost every bottom? And things can easily be layered for various types of weather. What’s missing from this wardrobe? Well, as I was packing for France I was really wanting to include a navy trench coat, which has been on my sewing list for quite a while. I started sewing it this past weekend and it’s nearly finished, so I’ll show you that soon as well. It will be extremely useful in the transitional months. I would pack that in place of the camel blazer. Is this all I wear? Absolutely not! I’m a clothing designer, remember? And I like more diversity in my clothing choices. But this is the basis of my wardrobe, and right now I wear these pieces more than anything else I own. On any given day I’m probably wearing at least one of these items. I combine them with other items in addition to wearing them together, which is why I call them a core wardrobe. 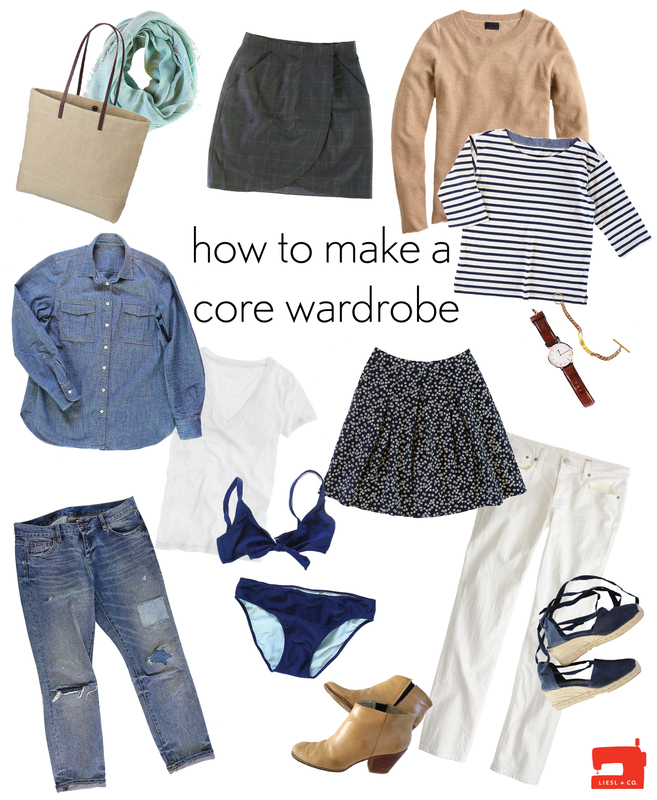 Does this help you to think about your own core wardrobe? If this is useful to you I’ll do another post like this when we get closer to summer. As the weather warms up I’ll gradually swap out the warmer pieces for a few summer dresses and more skirts. I’ve also been Instagramming my daily outfits from this group, just to show you how I style everything together. You can see them on my personal Instagram account with the hashtag #dailycorewardrobe. I’d love to see yours, too. Feel free to use the same hashtag for your own core wardrobe. Maybe we can make it a project! Great article! I can really see how these would be a great base for a wardrobe. My question is revolving around traveling with a core wardrobe–I typically wear bottoms & sweaters more than once but tops (next or the skin) only once. Would you recommend either washing the tops if there’s not one per day, or would you recommend adding a couple more tops? I would likely have enough room in my carry on for a couple more tops. In that case I’d probably pack a few more lightweight tops. In winter I often wear a lighweight V-neck T under other tops to eliminate the need to wash frequently. It probably comes from when I was little and Mom made us wear undershirts. But that might be a solution, too? It’s a lovely collection! I also love navy, whites, denim and camel colors. Can you tell me what program you use to photograph your items? I would love to one day have a photo library of my clothes. That may be a just dream though, sigh! Thanks, Jill! 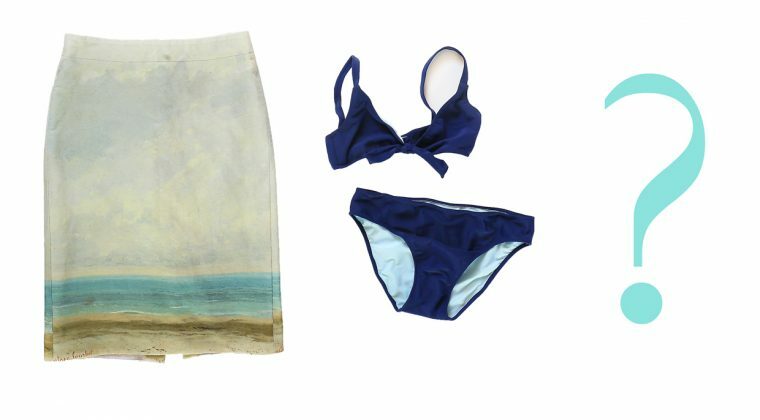 I used Photoshop after taking many of the photos myself, and a few of them are from the websites of the stores where I purchased these items. (I try to remember to save the photo when I buy something.) But I have a few ideas for you that I’ll share in greater depth on Friday in my weekend links post, ok? Thanks for sharing! I love posts like this. It helps me focus on sewing clothes I will wear rather than lots of crazy items that don’t coordinate. Would love to see another post for summer. Thanks for the feedback, Kerri! I’ll make sure to follow up soon when I’ve switched over to warm-weather clothes. I am a bit of a clothes horse, so while I love the idea of a core wardrobe, I’ve never really been able to pull it off in real life. Do you ever get bored? Or wish for more colour? Also, how do those of us with very distinct clothing needs (a professional work environment and parenting a preschooler and a toddler, in my case!) work within the core wardrobe concept? Love this, Liesl! It looks like you and I have similar tastes. Thank you very much for sharing and can’t wait to see your summer core wardrobe! Thanks, Cherie! Glad you like it! I love a core wardrobe. I have 2 – a professional one (I’m a lawyer) and a personal one. We are currently traveling in Europe for 3 weeks and it is the first time I have worn everything I have brought. I use the sudoku formula – but the result is the same. The clothes have takren me from casual outings to a gallery or a local park to the Paris Ritz (literally) with 16 core garments including shoes and accessories … I brought one each extra of jacket, shoes and skirt – none were really needed – I brought no denim and no jeans … only one pair of pants but 3 different weight and colour scarves. It has been fun, fab and versatile. It has revolutionised the way I Dress. I intend to adopt this for the rest of my life. I love it and can’t recommend it highly enough. The sudoko formula is a new concept for me, but I’ve been using the core wardrobe since we moved to New York as poor college graduates 26 years ago. I’m so glad it’s worked for you, too! It’s a real time, space, and money saver. Enjoy your travels! I really enjoyed reading this, as I am in the midst of sewing a capsule wardrobe for the first time. As I understand it, your core wardrobe isn’t only a capsule, though – it’s also a set of pieces that tie everything else together. This is what my own closet has been missing, and what I think a lot of us who make our own clothes often struggle with – how to make sure you can actually pair your makes with other items in your closet. Looking forward to using this hashtag. I’m glad you like it! Yes, it’s the essentials that help you to make outfits both by using just those essential pieces but also by adding other elements from your wardrobe. And yes, too, to the challenge of sewing one when there are so many fun prints and conversational fabrics in the fabric store just begging for your attention! It helps to stay focused. And to occasionally sew those other pieces, just for fun, too! Thanks for this post! I would love to see a summer edition. I’m home with a 2, 4, & 6 year old and have fallen into a jeans & t-shirt rut. I’d really like to develop a core wardrobe that works with a very casual lifestyle but is a little more put together. This gives me a lot to think about. Thank you so much for doing this on your blog – I have been following on Instagram and it is nice to see everything together. And what you have is pretty much what I want in my own core wardrobe, which I have started planning because I really can say my closet is pretty bare and I have nothing to wear. I love your choice of jackets both are my bucket/wish list of things to have in my core wardrobe. I am hoping to sew both a denim jacket and camel color jacket since RTW never ever fits me properly. I don’t know if either are a denim jacket or just a classic jacket are on your design table but I sure would love to have patterns for both and your designs are my fav very clean crisp lines, that are easy to sew and look great. O and a V neck sweater pattern would be nice have to to add to any core wardrobe too. I just love that there is a distinction between, and a need for, a cream with navy stripes top and a navy with cream stripes top. As a stripe lover I get it!